This is a self-help book for a task none of us ever wishes to have. Langton-Gilks explains that it is not a medical textbook, not a description of her journey (her son David, or DD, died of medulloblastoma), and not ‘a religious, healing sort of book.’ It is about palliative care — end-of-life care in particular — and dealing with loss before death occurs, also called anticipatory grieving. Langton-Gilks describes herself as a singing teacher, children’s choir director, gardener, writer, and cook. The two opening chapters are about ‘Difficult Conversations — An Incurable Diagnosis and The Advance Care Plan.’ She notes that these should be termed Important Conversations if you are a health care professional. In straightforward language, she deals with such things as fear, denial, hope, parallel planning (hoping for the best but preparing for the worst), telling the child and their siblings, and listening to the child (‘young people are the experts in their own condition’). The chapter on advance planning tells you the what, who, when, and why, including what treatments you do or do not want the child to have, do not resuscitate (DNR) orders, wishes regarding the place of death, preferences for laying out and funeral arrangements, memory creation, and tissue donation. I admired what Langton-Gilks calls her anti-panic protocols to deal with emergency situations. For example, if you and your child elect for home care and do not wish to be readmitted to hospital, you need a plan of action should some crisis occur in order to prevent some well-meaning person automatically sending your child straight back to hospital. The next two chapters are about the last two weeks and the last day or two, respectively. It tells you what is happening, what to expect, the physical signs of impending death and death itself, and what you can do. The last two chapters are about the hours after death and what Langton-Gilks calls celebration — the burial or cremation and other ceremonies. 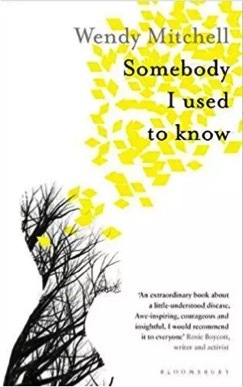 Throughout the book, each chapter concludes with a section, ‘How it worked out for us and others,’ in which Langton-Gilks tells how things went with her son, DD, and several short reports from other parents in like circumstances. As a bonus, there is an impressive and detailed 28-page appendix titled, ‘Integrated Person-Centred Planning for Children, Young People and Families Receiving Palliative Care: Guidance and Toolkit,’ written by three individuals (one a nurse) well versed in person-centered care. To have this would be a great help to anyone facing the task of advance care planning for a terminally ill child. 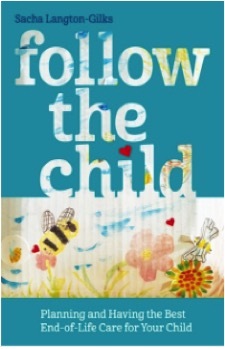 I thought this book would be extraordinarily useful for any parent faced with the problems of a dying child. But I also thought that anybody working in palliative care, particularly pediatric palliative care, would benefit from reading this book, as it demonstrates many of the things that we should do or should not do described, as it were, from the other side of the desk. Any parent given the Incurable Diagnosis should also be told about this book. Dr. Shahid Aziz graduated from King Edward Medical College in Lahore, Pakistan, and then trained in pediatrics in Maryland, USA. He became increasingly involved with clinical ethics and end-of-life issues, and achieved board certification in hospice and palliative medicine. It sounds as though his work for the last 20 years or so has been essentially in palliative care. 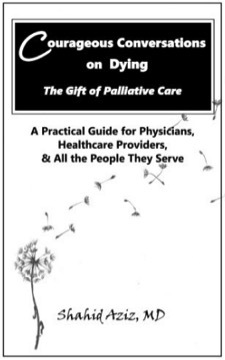 The aim of this book is to provide physicians and health care workers with a practical guide on how to have conversations on death and dying and related end-of-life issues. At the outset, he stresses the inevitability of dying and that any planning must be done before you need it. We, as physicians and health care workers, have a responsibility to facilitate and guide our patients through their decision-making for end of life, articulating their goals that will, in turn, shape their plan of care. The book has 33 short chapters that deal with all aspects of communication in palliative care: the communication itself, how to communicate better, how to assist/facilitate advance care planning (ACP), listening, addressing DNR/DNAR, a list of attitudes and phrases best avoided, how to talk to someone asking for physician-assisted death, and a lot more. Each chapter has illustrative clinical vignettes as well as examples of what one might say in different situations. In order to improve advance care planning, he says, ‘I am now a believer that all hospital patients who do not have advance directives should have their ACP done before they leave the hospital. At a minimum, all patients with chronic illnesses, life-limiting illnesses, and dementia, as well as all ICU patients, need an automatic palliative care consultation’ as a means of getting the ACPs done. Whilst I can appreciate the benefits that might bring, I see an enormous amount of work for already understaffed palliative care services, and there would be a mighty backlash from other doctors who would not want the palliative care people talking to their patients about death and dying, even though there is evidence that many of them would be better off having an ACP. Food for thought. 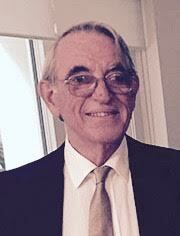 Michael Kearney’s books have featured in this column on several occasions. In 2010, I reviewed Mortally Wounded: Stories of Soul Pain, Death, and Healing (reprinted by Spring Journal Books in 2007), a collection of clinical stories about ‘soul pain’ in which Kearney, with a generous dose of Greek mythology, psychology, and image work, describes how we might go about enabling our terminally ill patients to find inner peace. I also reviewed A Place of Healing: Working with Suffering in Living and Dying (reprinted by Spring Journal Books in 2009), which addresses the limitations of the medical model in palliative care and, with much reference to Asklepian healing and Jungian psychology, sets about exploring how we might be able to do more for the ‘suffering of the soul.’ Both were enjoyable as well as thought provoking, even if I did feel a little challenged here and there. 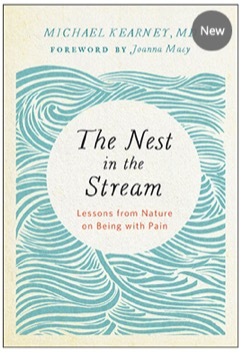 The Nest in the Stream is the continued explorations of an experienced palliative care physician into the non-physical aspects of human pain and suffering, and how we as professionals should deal with it. His experience with multiple episodes of medical neglect for people with advanced disease led to his working at St. Christopher’s Hospice in 1980. He enjoyed being a healer, but admitted to psychological overload listening to all the suffering. He undertook psychological counselling, which he says led to an exploration of the unconscious that has continued for the rest of his life. Initially it was only personal, but it slowly developed to involve his professional work. He complains that modern medicine has ‘invested its all in the historical figure of Hippocrates and his method of deductive reasoning and evidence-based biological materialism.’ And forgotten its origins in the myths of Chiron (known as ‘the wounded healer’) and Asklepios and the principle they represent of working with nature for the healing of suffering. The medical model allowed him to treat ‘fixable’ pain, the path of the wounded healer provided a way of being with another in their ‘unfixable’ pain, but nothing told him what to do with his own pain. Kearney describes his lifelong personal comfort of being with nature. Nature, he says, could be both beautiful or ruthless and has a life of her own. He feels there is profound disrespect for the healing power of nature. He relates the stories of seven encounters he has had with other-than-human nature, one of which involved a nest in a stream and how, through increasing immersion in the teachings of nature, he came upon a personally transformative way of managing his own pain. He ends by describing his own daily practices. These include a range of meditative practices including mindfulness of breathing meditation and ‘inner connection,’ reflections on his experiences (related in the seven stories), nature connection, prayer and participation in a weekly sweat lodge ceremony. I have no problem trying to improve what we do for the non-physical aspects of pain and suffering in our terminally ill patients. And if there are means by which the stress and pain of looking after these patients can be lessened, all well and good — particularly if by helping the professional, the patient gets better care. What Kearney describes obviously works for him, but only you can decide whether it works for you. I found it almost fascinating, but I am just not sure whether it is for me. Seems Elisha Waldman is a restless soul. He was raised in Connecticut and did his undergraduate degree at Yale, before going to medical school in Tel Aviv. After a number of years of postgraduate training in Boston and New York, he qualified as a specialist pediatric oncologist. But after a year in practice, he could no longer resist making aliyah — moving to the ‘Land of Israel’ — in order ‘to reinvent’ himself. He spent a number of years at the Hadassah Medical Center in Jerusalem before doing a 12-month fellowship in pediatric palliative care in Boston. He went back to Jerusalem, keen to create the first pediatric palliative care unit in the Middle East, but the hospital was in severe financial difficulties, and there was a war going on. So he moved back to work at the children’s hospital at the Columbia University Medical Center in New York; the dust jacket indicates he now works in Chicago. 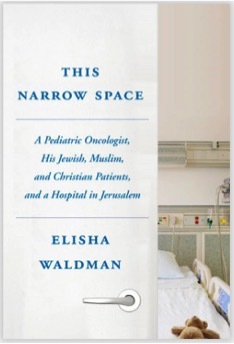 Set against a background of the Palestinian conflict and Waldman’s own personal indecisions (about what he should do with his life and where it would be best to live), this book provides a beautiful description of some of the patients he treated in Jerusalem, dealing with all the barriers — languages, religions, political and cultural divides — all of which get worse when there is overt military conflict. And things are tough enough without open warfare, like the Palestinian man who declared that he’d rather have a dead daughter than a daughter without a leg. He describes the book as stories of children who do not survive, and some who do, and the spectrum of their suffering; it may vary in some ways, but they all suffer. Even before he went off to train in palliative care, I was admiring his clinical attitude. He seemed to have a holistic approach and was interested in the person and not just the disease. He describes what is going on in the heads of both his young patients and their parents, as well as in his own. He refers to Ecclesiastes (a time to be silent and a time to speak) and discusses the challenge of knowing when to sit in silence and just be present. And if his patients developed progression of their disease, he was in there doing everything a good palliative care doctor would do, both in terms of treatment and communication. He talks of the natural tendency to avoid the difficult conversations, those acknowledging the inevitability of death; even when there is need to convey a realistic outlook, we hide behind the excuse of not wanting to destroy hope. Waldman describes the curious situation of spiritual care in Israeli health care. He feels it is ironic that the medical system has deliberately removed religion and spirituality from consideration in matters of patient care, but ‘is in so many ways in thrall to rabbis with no formal medical training.’ It seems that people seek the advice of the rabbi regarding which doctor they should see and what treatments they should have, and any advance care planning must be in keeping with what the rabbi said. I grew a little tired of his indecision and I doubt I would be able to work in Israel, but I admired his doctoring. After training in pediatric palliative care, he recounts what one of his teachers told him as a student. ‘Never forget, if you accompany your patients only until the battle is lost and they are dying, if you abandon them at that point and leave them alone, you have done only part of your job, and not done it well. Your job is to accompany your patients until they are either better or safely on the other side.’ Amen to that! I think anyone who works in palliative care will find reading this book both enjoyable and illuminating. I did. Dr. Kathleen Benton has a master’s degree in medical ethics and a doctorate in public health. She is the director of clinical ethics and palliative care at St. Joseph’s/Candler hospitals in Savannah, Georgia, USA. 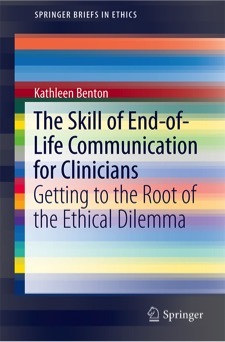 This book is about the minefield of ethical dilemmas and communication issues found in end-of-life care, and is intended for use in the education of medical students and other health care professionals. The first part of the book is centered on the story of Daniel, the author’s 30-year-old younger brother who was dying slowly with Proteus syndrome (elephant man disease). He was not an easy patient; his attitude was to demand that everything be done, to never give up, and it sounds as though he argued vehemently against anyone who even suggested anything else. The problems in Daniel’s case (for patient, family, and professionals alike) are used as a springboard to a wider discussion of the ethical dilemmas and communication issues that may arise in end-of-life care. Chapter 4 is made up of 19 clinical vignettes chosen to present a range of ‘usual’ problems related to ethical dilemmas and communication issues in end-of-life care, each followed by several questions to prompt discussion. I enjoyed reading some of these and thought they would be appropriate for teaching medical and other health care professional undergraduates. The last chapter is about the skills needed to communicate clearly, something nearly all doctors and health care professionals need to learn. It lists 12 different skills with an explanation of what they entail and why they are important, together with case study examples. It reinforces the calls for formal teaching about communication, particularly in the context of end-of-life care, to be incorporated in undergraduate training. And the take-home message? Patients and families have a whole spectrum of attitudes to dying and death. Likewise, doctors and other health care professionals vary greatly in their attitudes towards death and the dying. But you can walk with your patients through the end of life if you agree to meet them where they are. If not, you are abandoning them to go it alone or with providers who are new to them. I think this book provides a worthwhile discussion, at an undergraduate level, of the ethical dilemmas and communication issues that may arise in end-of-life care. This is a detailed account of the physical and cognitive changes that heralded the diagnosis and progression of Wendy Mitchell’s early-onset Alzheimer’s dementia. Previously a non-clinical team leader in the English National Health Service (NHS), who spent her weekends running and climbing mountains, there is a distressingly clear description of the losses she suffers over time and how she felt and coped. Mitchell reflects on these in a series of conversations with the person she used to be. Throughout, I was struck by the clarity and detail — both medical and psychological — for which I assume Anna Wharton takes some credit. I note that 92% of 152 reviewers at amazon.co.uk gave it five stars. If your work involves patients with Alzheimer’s disease and other dementias, this book provides a lucid account from the patient’s perspective of the range of problems they may encounter — from coping with day-to-day living to contemplating physician-assisted dying — which may enable you to be of more assistance in helping them help themselves. When you shop at AmazonSmile, Amazon donates a portion of your purchase to IAHPC at no added cost to you. You get the same prices and selection as Amazon.com, along with the pleasure of supporting IAHPC in its mission to advance hospice and palliative care globally. It’s enough to put a smile on your face!